Flag Points episode 44 is up, and we talked all about the Christmas catalogs/Wish books of old. I take the Knock It Off segment again, and it’s also catalog based. As you listen to the segment, follow along to the page from the 1987 JC Penney Christmas catalog right here. I promise it will be even more entertaining with a visual aid. On a side note, it looks like Flag Points will be winding down (for the foreseeable future) in a few months. I’m very grateful to Dave and Don for having me on the show as a co-host for the past couple of years. It’s been a blast! A pity it is going. Another great episode. 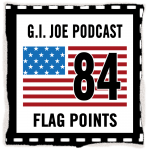 I’ve really enjoyed the Flag Points podcast, and particularly the more obscure stuff you’ve covered and Page’s recent eBay segments. Thanks for all of the time you’ve given to the podcast! They did a great work! Big thanks to Rob for everything! He made the show what it has become! I was grateful just to be a part of it. Definitely the most fun experience I’ve had as a Joe fan. still wanna hike along that spectacular pine ridge!